At the grand old age of 20, I was a married woman living in a new country, with my brand new husband, parents-in-law, sister-in-law and her husband. Up to this point my only effort had been a Chocolate Cinnamon Cake, which my cousin and I had “baked”. Actually, the Cook had baked it and we kind of pretended to be very busy and important by helping in bits and claiming it was us who did it! We did try and make some icing but ended up with some Chocolate Scrambled Eggs as we forgot to remove the hot chocolate from the stove before adding the eggs . To get back to my story, as a newly wed in a new country I was very far away from my pampered past and bohemian lifestyle of a Delhi University student who spent most of her time playing the sitar, working on some amateur theatre production, or organising the next cultural event at college. Please note the intricacies of cooking, baking or any other form of domesticity were very far removed from my life at that stage. My new World, however, was one of domesticity, which required know-how of clothes, cooking, jewelry, small talk, and all such things, which I had eschewed in my previous life. My life now was studded with Domestic Stars every which way I turned. Every party I went to, every new acquaintance I made, seemed to be armed with a zillion recipes and other attributes suitable to this lifestyle. Of course, every woman in/from India is supposed to be a whizz in the kitchen who conjures up feasts to please and enchant her in-laws and husband. Oh dear! How was I ever going to measure up? I remember thinking glumly, as I sat in a corner drinking my coke and wanting to melt into it just like the ice cube, that had been floating in it a minute ago. I just could not carry on like this; I had to do something to redeem myself. A medium round cake tin is fine or just come over and I will give you a suitable baking tin. A moderate oven is 180 degrees centigrade. You need to pre-heat an oven for at least 10 minutes so that the oven has reached the desired temperature before you put the cake in to bake. First take the butter out of the fridge so that it is softened. Avoid trying to heat it to soften or it will turn into runny ghee and you’ll be in trouble because it will never fluff up properly and it will have a smell!! Then take the eggs and keep them out of the fridge so that they are at room temperature. If they are cold your cake batter will curdle when you add them to it. However, if that does happen just put the bowl with the batter into a larger pan with warm water and continue to beat till its OK.
Now get the flour, salt, baking powder and sift it together into a bowl. You can do this twice if you want to be fussy but it doesn’t matter. The whole idea is for all the ingredients to be mixed well and for any hard bits to get sifted out. Prepare the cake tin by taking a bit of butter and rubbing it all around the tin, this makes the pan non-stick. Do this even if it is a non-stick pan – it just helps. Now take a tablespoon of the dry mixture and put it in the pan and roll it around so that there is thin layer of the mixture on the pan. Shake out any excess. This is called greasing and flouring. You can use plain flour but that may leave a whitish film outside your cake at the end. This way you will have used the cake batter and there wont be any residue. Take a large enough bowl which can fit all your ingredients in it and get your beaters out. You do have good electric beaters, don’t you? If you don’t, you are welcome to come over and borrow mine. Into the bowl add the butter, sugar and vanilla and beat till you have a fluffy, pale mixture which looks light and airy. At a guess I would say about 5 minutes or so on high speed. Now add the eggs one at a time and continue beating on high. Beat for one minute after each addition. More is fine. Remember this is where you are trapping air into the batter so that your cake is light and fluffy. Now reduce the speed of the beaters to low and add your dry ingredients – do this in at least three batches. Make sure it is all nicely mixed together. Do not over beat at this time or the fluffiness will go and you’ll get a stodgy cake. You can even use a wooden spoon to incorporate the dry stuff using the “cut and fold” method to incorporate them but make sure you cut and fold gently and in the same direction so as to trap air rather than vigorously mixing it so it looses all the airiness!! If at this stage the cake batter seems very thick and sticky gently mix n half a cup of milk to get a nice smooth batter of a thick custard consistency. Pour the batter into your pan. An ideal pan is one where the batter fills up two-thirds of the pan and no more. This allows the cake to rise properly and retain its shape and texture. Now place your pan in the centre of the pre-heated oven. Leave it to bake for thirty minutes and then check by inserting a wooden pick in the centre and wiping the pick on a clean tissue – there should be no sticky residue. You can also test by pressing the cake gently – if it springs back its done!!. At this stage you will note that the cake has come away from the sides of the pan. Wait there’s more….. when the cake is done you need to take it out and turn it on to a wire rack – just use oven gloves and first run a sharp knife right around the cake then turn the pan upside down on the rack and tap gently at the base. Leave to cool for five minutes and you’re done……. “Have fun and don’t panic – I’m sure it will be fine.”, She said, before she rang off. ………… and that was the beginning of a lifelong affair with this recipe. I have used it in various permutations and combinations since then but the original is my gold standard. Often, I have doubled it and used it as the base for various birthday cakes and Gâteaux. - Drain the pineapple pieces and slices and reserve the juice. - Whip the cream till soft peaks are formed. - Once the Cake has completely cooled, carefully cut it into three layers. - Sprinkle a few tablespoons of reserved juice on the bottom layer of the cake and spread with a few tablespoons of cream. 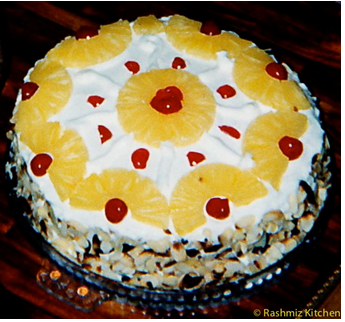 - Spread some pineapple pieces and another few tablespoons of cream. Cover with the middle layer and repeat the process. - Now sprinkle juice on the top layer and spread generously with the cream. Go over the cream with a spatula/knife which has been dipped in very hot water – this will give the cake a very smooth and professional finish. - Cover the sides with cream and press the almonds on to the sides. Beautiful cake, everybody learns with little things. Such an adorable cake !